Winner of ABC TV Sweet Retreats Show on LiveWell Network, Whidbey Island episode! Whidbey Island's finest vacation rental property, this spacious 4 bedroom/3 bath vacation home with two adjacent one bedroom cabins is sited on 155' of 'sugar sand' no-bank waterfront facing west. Build castles on the beautiful sandy beach. Cast for salmon from the beach. Cook an outdoor feast in the beachfront barbecue pit and celebrate the sunset with your friends at the covered picnic table, right on the beach. An easy stroll to the south are the towering firs and old growth hiking trails of South Whidbey State Park. There are many beautiful vacation homes on Whidbey Island; we can uniquely offer a walk-out sandy beach with sunsets, views of the complete Olympic mountain range, spacious grounds with large lawn and gardens, a stunning and private wooded setting. A gourmet kitchen designed for groups caps a two year major remodel, bringing interiors to world class luxury standards. The interiors complement the gorgeous views from every window. Each of the 6 bedrooms have astounding water views. Offering luxury amenities and good design, the Beachfront House and its two adjacent cabins provide over 4200 square feet of luxury space, with over 1200 more in exterior living space. A major remodel by Seattle architect was recently completed by Bruce Stock and Associates with interior styling by designer Lisa Wise . Amazing beach, water, and mountain views are framed from every room. A huge open plan kitchen offers granite countertops, teak trestle dining set seating 10-12, and every appliance and utensil we could think of. Our two largest bedrooms each include a king bed. A third contains a queen bed and twin bunk beds. A fourth contains a twin with trundle bed and opens directly into Bedroom three, great for a family arrangement. You’ll find oak and cork floors, antique Persian carpets, cedar clad cathedral ceilings, 3 cozy gas fireplaces, entertainment size deck with outdoor speakers, and an cozy atrium room. The cute adjacent cabins have also been recently updated as well. Six comfortable bedrooms with high end linens: Each of the two adjacent one bedroom cabins are furnished exquisitely, with fine linens and cozy bedding, including a queen Westin Heavenly Bed in the Beach Cabin. Each cabin has its own bathroom, as well as satellite TV service, phone/intercom, and of course a coffee-maker. A lighted concrete path and phone intercom system connects the three structures, allowing both privacy and togetherness at your option. All bedrooms have 300-600 thread count linens, down comforters, and designer furnishings. Great amenities for business retreats or families: Property amenities include a Hotspring hot tub with Ozonator, HDTV upstairs with DVD and Satellite service, 46' widescreen HDTV downstairs with XBox Kinect system, Xbox games, and DVD, multi-room stereo with huge CD collection, stainless steel BBQ, teak outdoor furniture, game table, fully stocked gourmet kitchen with all new appliances, double laundry, and a wide selection of games and books. Come join us for your vacation or business retreat on beautiful Whidbey Island! Nancy and Al are both native Washingtonians who have lived in Boston, San Diego, and Auckland, NZ, and who happily returned to Seattle in the early 90's. They live in West Seattle and have 3 children. Nancy is on the board of Washington Conservation Voters. She loves cycling, hiking, gardening, good architecture, playing piano, and watching her kids play sports- soccer and rowing. My husband and I looked for Whidbey Island real estate for 2 years before purchasing this property on Whidbey's westside. 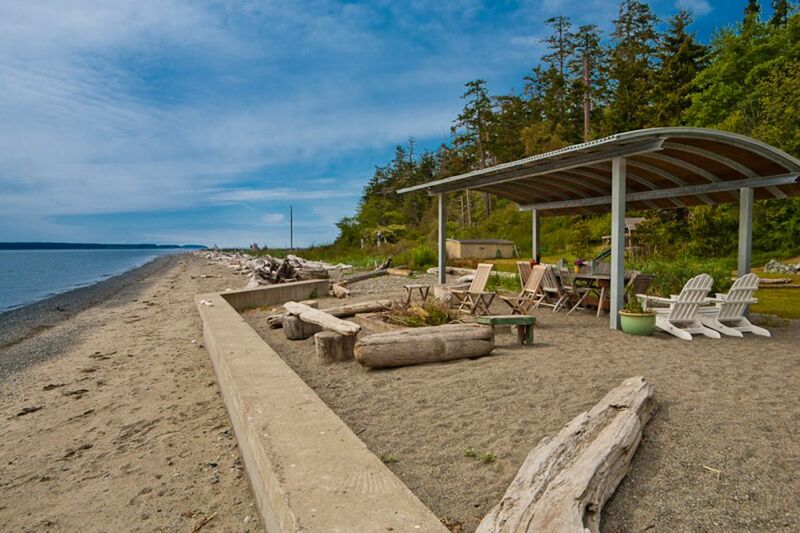 It is truly the best beach location on Whidbey, and we bought it for the incredible views, sandy beach and SW facing aspect. Over the past 10 years, we have done extensive remodeling to bring the structures to luxury standards and enjoy sharing our 'Kennedy compound' (as friends have termed it!) with newer guests as well as families who return year after year. We donated most of our profits to environmental and women's health charities, with well over $60,000 donated over the past 5 years. We have used VRBO to introduce the property to new guests for over 8 years now. There is a sixth bathroom in the pool house, not included in the above list. In floor heating in bathroom, and electric towel warmers. 2 sets of HE front load washer/dryers in main house, 1 set in Beach Cabin. 3 cars next to house, more spots available up near garage. Wired Cat 5, and wireless both available. Wood stove in the beach cabin. Electic heat in beach cabin as well. Two (2) Bosch dishwashers in Main House kitchen makes cleanup from large group dinners easy. A third Bosch dishwasher is in the Beach Cabin. Subzero all refrigerator (large) and separate freezer drawers in another appliance. Electrolux European Gas Stove with 6 high BTU capable burners on stove top. Espresso machine, Mr. Coffee, Keurig machine and French Press provided. Excellent stereo with quality speakers and Ipod connection. Extensive library in living room filled with fiction, non-fiction, and a great collection of Lonely Planet travel books for inspiration. Lots of childrens books too, for all ages. Huge volleyball court sized lawn right at the beach. Great for croquet, baseball, badminton, and volleyball. No mooring buoy, but bring your own anchor. Great public courts are just 15 minutes away. Fenced pool open from Memorial Day to Labor Day. Solar Heated. The main house has just been remodeled and has all new luxury bedrooms, bathrooms, and a new deck. Steam shower and 2 person soaking tub in the new master bath, which opens onto the master bedroom with the beach and mountain views beyond. There is a new Westin Heavenly Bed with 600 thread count linens and down comforter in the Beach Cabin. Master bedroom has office area with internet, phone, printer. Two 46' 1080p HDTVs with hi-def satellite reception. 2 other TV systems on the property. DSL High Speed Internet Service works throughout the property, even at the beach. Fabulous property, house, grounds, accommodations, supplies. Property manager quick to respond to any questions. We didn't know what to expect from the 2 extra cottages/bedrooms but they were perfect for our couples without children. The main house bedrooms were great for the families, the master bedroom was great. View from every room spectacular! We are so happy that you were so pleased with the property. It is a very special place and you certainly had an opportunity to enjoy the beauty of the winter season - wind and sun! Thank you so much for your care of the house and grounds and your great communication. We would love to host your family again in the future. We stayed in early November, and I felt like this was a great place to stay in any season. Obviously the waterside pool is closed outside of summer, but it looked spectacular. We had 5 couples, two with kids, and the set-up was great for that. Couples who may want some privacy can stay in one of the detached bungalows, both which have bathrooms. The master bedroom is well insulated from sound; I'm not 100% sure if any of the bedrooms shared walls. Finally, the open floor plan of the kitchen and living room was perfect for a group of people cooking and socializing, and had amazing views. The house is fully stocked with anything you might need during your stay. Fantastic views across Admiralty Inlet and hikes on the beach when the rain stopped. A great kitchen and dining set-up for an extended family Thanksgiving gathering -- ages 1 to 80 enjoyed it all. Comfy beds; soothing hot tub after football game; views everywhere. Thank you for sharing your home. This was a perfect spot to share with our 5 children, their spouses and the new grandchildren. Plenty to enjoy, hiking, campfires, swimming, and hot tub. Kitchen was wonderfully stocked. We used produce from farmers market and convenient grocery store to cook great meals. Loved the separate cabins also. Dream vacation for families. Our property is sited on the South End of Whidbey Island, just north of Bush Point on Whidbey's 'Gold Coast'. There are only a couple of waterfront homes in our area. Most of the shoreline for a mile either direction is in its natural state. Whidbey Island’s west side real estate is always most expensive; with coveted Olympic Mountain, Puget Sound and shipping lane views, sunsets, and sandy beaches. Our particular location on the west side around the point from the beautiful but closely developed Mutiny Bay area is even better. Recent upgrades have made Whidbey Beachfront House and Cabins the premier luxury vacation rental on Puget Sound- a romantic retreat for 2 couples, or bring the extended family- we sleep up to 14. Why be elbow to elbow with neighbors in a beach development when you can enjoy a true luxury retreat away from it all, yet just 90 minutes from Seattle?